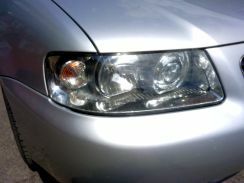 Cloudy headlamps can now be refurbished and given a new lease of life. We work with major insurers and all of our work is Gauranteed. Following a full assessment by one of our experienced estimators and insurance company approval, your car will be booked in for repair at a mutually convenient time. 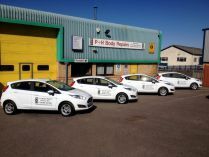 At P & H body repairers we have the specialist equipment and experienced technicians to repair and paint your vehicle to the highest standards. We use environmentally friendly water borne paint, and all paint jobs, no matter how small, are dried in a specialist thermostatically controlled oven. Paint mixes are calculated by computer to ensure the correct match. 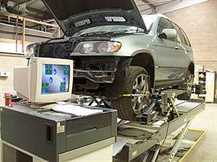 We have the facility on site for precise computer aided chassis measurement and alignment. 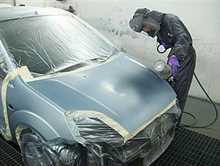 Throughout the repair you will be kept up to date with progress on your vehicle. Courtesy cars are available. 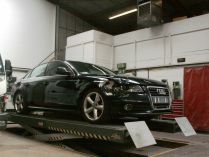 We aim to repair and return your car to you in the shortest possible time. 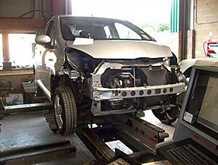 P & H Body Repairs are specialists in all forms of vehicle crash repairs. The Shark uses ultrasound technology to collect measurements and track your repairs. Emitters on the probes are attached to the vehicle at specific points and send ultrasonic signals that are received by high-frequency microphones located in the light-weight extruded aluminum beam. We have the latest 4 wheel geometry equipment together with the skilled staff to diagnose and rectify all problems. The results are compared to manufacturer specs and any problem areas are identified automatically. This leaves the operator free to concentrate on straightening, not on how to collect measurements. Color experts in our PPG labs in Europe and the U.S. worked in close contact with car manufactures and pigment suppliers to create precise OEM matches of some 19,000 prime color formulas dating as far back as 1986 as well as variant formulas from 1996. PPG achieved its cutting-edge level of color matching by drawing on many of its world resources and research centers in Milan, Italy where it is made, Stowmarket, UK, Whittier California, Allison Park Pennsylvania, and Cleveland Ohio. PPG's global waterborne platform team shared a primary focus, advancing colour match to meet or exceed its most discerning customers.